In StaffMap, all new projects are created from a base project template. This project template comes pre-installed with StaffMap as a demo project set up with a floorplan and some employee and desk panels. The template project can be found in the StaffMap file directory (e.g. 'C:\Program Files\StaffMap 2\template_project\'). The template project can be edited within StaffMap. 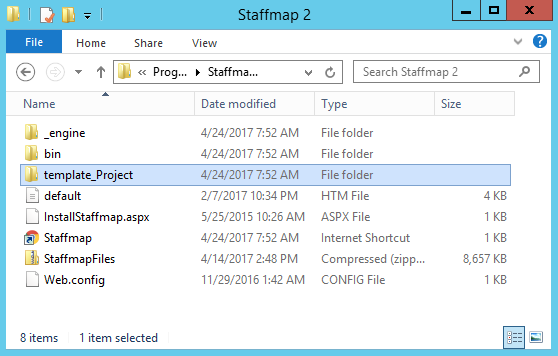 Open the StaffMap file directory on the server it is installed to and look for the 'template_project' folder. Change the name of the template project folder to 'xtemplate_project'. The template will now appear as a regular project in the StaffMap manage projects form. Open the template project, log in as a user who can make edits to the floorplan, and make the desired changes. After editing, rename the project file folder back to 'template_project'. Newly created projects will now implement the edits made to the template project.